A.S. Election Manager Kyler Vaughn announced the results of the highly contentious 2019 A.S. elections this evening. FRESH START candidates Eleanor Grudin and Melina Reynoso will be next year’s A.S. President and Vice President of Campus Affairs, respectively. Former Tritons United member Tiger Huang won the Vice President of External Affairs race. All three candidates ran unopposed as their competitors were deemed ineligible for not meeting the GPA requirement. This year 4,097 students — 17.52 percent of the undergraduate body — voted on TritonLink. 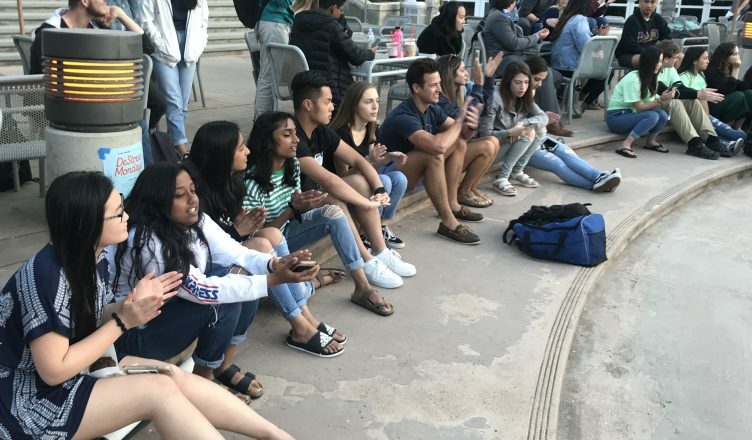 In the campus-wide Senator race, students voted to elect independent candidate Nancy Zhang and FRESH START candidates Nick Lee, Kaitlyn Willoughby, David Hickman, Kimberly Giangtran. Furthermore, independent candidates Deema Alsaied and Ale Felix won the Off-Campus Senator seats, while FRESH START candidate Yusuf Hamid Altimimi won Transfer Senator. In addition, FRESH START candidate Harry Huang, independent candidate Amor Goetz, FRESH START candidate Efran Elias Martinez, FRESH START candidate Shirley Zhang, FRESH START candidate Annika Manlutac won the races for Arts and Humanities Senator, Biological Sciences Senator, Engineering Senator, Physical Sciences Senator, and Social Sciences Senator, respectively. The FRESH START slate won 11 of the 16 A.S. Council positions that students can vote on. Independent candidates won the remaining five. The referendum to increase the Thurgood Marshall College Student Activity fee passed, while the one for Earl Warren College failed to meet the necessary turnout threshold of 20 percent and failed to receive a majority from those who did vote. Several controversies have occurred throughout the elections process, as the slate Tritons United was disbanded and disqualified after their presidential candidate Joey Giltner was first deemed ineligible to run and then found to have committed multiple violations of the elections code. Danielle Viviani, who was on the slate Triton’s United before it disbanded, mentioned that the reason that Tritons United disbanded was that the Tritons United management had not been transparent with its members. “A divide and conquer strategy was consistently used, whereby individuals who brought forth complaints or concerns were individually spoken to, felt heard and consoled and then, any complaints or concerns made in a group setting were responded to with the claim that no one had approached management individually,” Viviani wrote in a statement explaining the decision of the slate to disband. All the remaining members decided to run as independent candidates. Although Tritons United had already disbanded, the complications with the election proceedings continued when the Judicial Board granted Giltner’s appeal of his ineligibility due to his GPA on the grounds that his transfer grades should be included in the calculation. However, Giltner was ultimately still disqualified by the elections committee as Tritons United had already been disqualified, Vaughn informed the Guardian on April 11. Giltner responded by appealing this decision, stating that he had been denied a fair hearing as he had not been able to attend the hearing. He additionally filed for an injunction, which would pause everything in terms of the election until the Judicial Board could meet and discuss the outstanding grievances. The injunction concerned the fact that current elections have violated free and fair elections and that candidates were unfairly taken off the ballot. The Judicial Board dismissed his appeals in a meeting this afternoon and granted the injunction. However, due to the fact that the injunction only lasted until the Judicial Board was able to decide on the appeals, the injunction was immediately over.